The race for the top four continues to surprise and enthrall. Manchester United, with two defeats in three, have seen their hopes dented but were given fresh optimism following Arsenal’s defeat at Everton. Now, with Tottenham Hotspur likely to be without Harry Kane for the remainder of the season, the Red Devils still have a fighting chance of securing Champions League football for next season. And West Ham on Saturday sees the start of a make-or-break period for Ole Gunnar Solskjaer’s side. After the Hammers, United must travel to Everton before hosting Manchester City and Chelsea to round out an intense month. Recent defeats to Arsenal and Wolves have heightened the importance surrounding West Ham’s trip to Old Trafford. With Chelsea and Arsenal not in action until Sunday and Monday respectively, the evening kick-off presents United with a golden opportunity to apply pressure on two of their rivals. Of course, United are also seeking revenge on Manuel Pellegrini’s Irons after September’s 3-1 defeat at the London Stadium. Felipe Anderson, who opened the scoring, was named man of the match that day and the Brazilian will be a threat again on Saturday. The Brazilian has shown flashes of brilliance since his club record £42million move from Lazio last summer. He is the Hammers’ top scorer with eight goals and has also contributed four assists. Having once admitted that he ‘dreams’ of playing for a club like United, the 25-year-old will be keen to make a lasting impression during his first visit to Old Trafford. Anderson’s skill, creativity and eye for goal will be key for the east Londoners but United will hope that Anthony Martial can continue his excellent record against the visitors. The Frenchman, who came on for the last 20 minutes of the defeat to Barcelona, loves facing West Ham. He has six goals and three assists in six previous encounters. Although the 23-year-old didn’t manage to find the target in September’s defeat, he scored one and assisted another in the 4-0 defeat of the Irons in August 2017. He also netted braces in the 4-1 EFL Cup win back in November 2016 and the 3-2 defeat in May that year, the last game ever played at Upton Park. West Ham are the club against whom Martial has produced the most (Everton are second, with five goals and two assists) and Solskjaer is banking on another sparkling performance from the winger come Saturday evening. Anderson and Martial share a lot of similarities. They are both quick, skilful players with excellent feet, adept at beating defenders and quickening the tempo of their team’s attacks. The South American has seen much more game time than his counterpart, though. Whereas Anderson has started all but one of West Ham’s games this season – an impressive return given that he was pegged as a talented but enigmatic player during his time in Italy – Martial has, at times, been a peripheral figure at Old Trafford this season, starting 16 league games. And while it’s certainly true that the 2015 Golden Boy winner has failed to take chances to impress when given a starting berth, his return of ten goals and two assists is stellar given his 1392 minutes on the pitch. In fact, Martial’s 0.64 goals per 90 minutes can be bettered by only two forwards in the Premier League this year (Sergio Aguero and Pierre-Emerick Aubameyang). He has often fashioned shooting opportunities for his teammates, too. 31 in total from open play equates to an average of 2.0 per 90, again ranking him third for players in his position. Finally, Martial has comfortably outperformed his open-play expected goals. His open-play goals-xG ratio (inc. first contacts from set pieces) of 1.64 is the second-highest in the division. Anderson is slightly different. His 0.26 goals per 90 pales in comparison to United’s No.11 but he, too, creates plenty of chances in open play; 41 in total this season. He has created nine ‘big chances’ for his teammates and completed more through balls than any West Ham player, so United must be alert to his defence-splitting prowess. 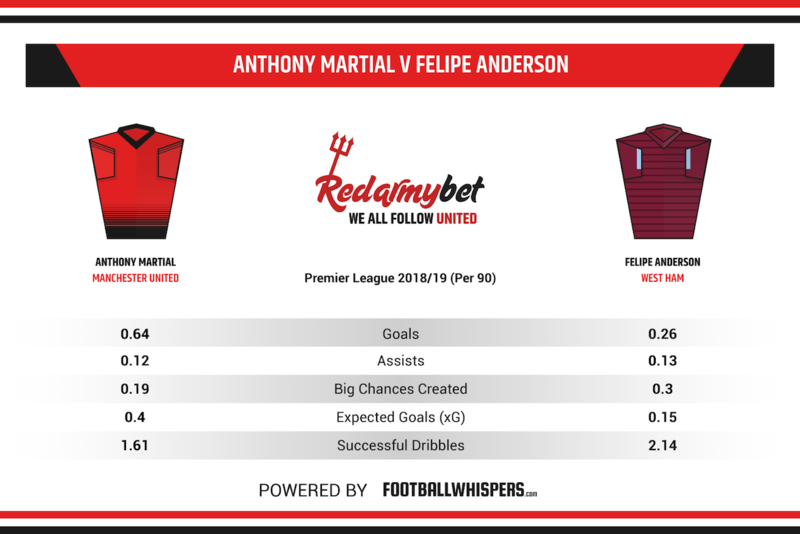 In a way, it’s difficult to predict which Martial and Anderson will show up. They have a tendency to produce both spectacular and indifferent performances. The former, for example, has paid the price for inconsistency with regular spots on the bench while the latter enjoyed a run of four goals in six games in December but hasn’t scored in the league since. Despite that, however, United know all too well the damage Anderson can cause. Solskajer will just hope Martial can out-do whatever the Brazilian conjures up.